Getsmartcoders has over 10 years of experience in developing automation solutions for enterprises. We leverage the latest technology and subject matter expertise in custom software development, big data analytics and machine learning to develop bespoke software suites that help to automate document classification. Our solutions leverage the diverse scope of machine learning in document management such as pattern recognition, probability determination and optical character recognition to provide you with a robust document classification and indexing solution. By deploying our solutions companies have been able to store large amounts of organizational data in a structured and error-free manner as well as bring down the time taken to scan, record and retrieve documents. The efficiency of an automated document classification solution depends on the extent to which the back end data recognition and classification systems have been optimized for a set of business processes. Our services are tailor-made to match the volumes and the nature of the data that your business accrues. Our software solutions are optimized according to your business processes and workflows. We classify all of your business documents by collecting multiple images of documents type. 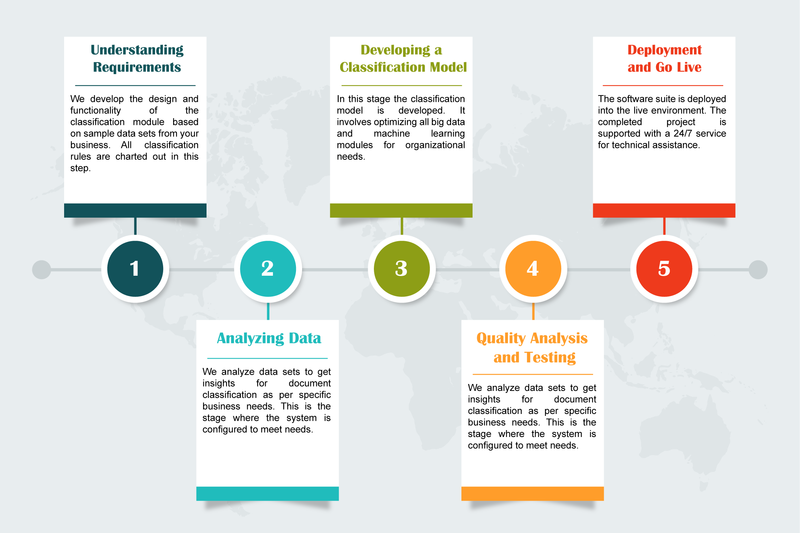 Our use of big data technology in our automatic document classification solution enables us to create a robust database for your organization and forms the foundation of the classification mechanism. We use advanced features like Optical Character Recognition(OCR) and Optical Mark Recognition (OMR) with inbuilt cognitive features to recognize the type and size of a document. We use the versatility and highly customizable capabilities of machine learning to create a self-learning module that can classify documents with ease and finesse. We build custom algorithms and incorporate them into the codebase of our software solution to increase the accuracy of document classification by more than 80%. The classification database is designed to be updated when you introduce new document types. You can group large volumes of data which can be automatically classified based on similarity in type or content without the need of manual intervention by a business analyst. The document groups are used for document classification, eliminating the need for conventional resource intensive document preparation methods. Our automatic document classification solution allows you to organize huge stacks of documents into easily usable folders with ease. You can quickly search and retrieve documents for business critical tasks. The software evolves to learn documents classification and document indexing by adapting to unlimited document classification and indexing configurations. As an experienced automatic document classification and indexing solutions company, we optimize our services to match the scale of your operations. For large scale enterprises, we turn to big data analytics frameworks like Hadoop to analyze the bulk of your organizational data and derive right insights. We then use it to develop the ideal means of classifying your business documents. We also provide consulting services to help you develop a plan for automatic document indexing implementation. Machine learning unlocks a wide array of possibilities that makes document classification and indexing more accurate and efficient. The power of a ‘self-learning’ system that adapts to changing document and data types can be largely beneficial to an organization. It reduces the amount of time and resources needed in document classification. Less manual intervention means less resources and time in classifying datasets and documents. This significantly reduces operational costs. Automation in document classification not only makes it easy to store data, but also makes it easy to retrieve it. Automatic document classification organizes your files and documents that makes maintenance easy and streamlined. Automatic Document Classification and Indexing requires the deployment of proprietary software packages that handle three critical tasks of the process which are, document scanning, the creation of a database and the criteria for documents classification. Each one of these tasks is achieved through the use of individual and unique approaches to software development. We use the diverse functionality of the Python programming language and the frameworks based on it, to deploy a highly scalable and lightweight solution for enterprises. We use the OpenCV library built essentially to achieve optical character recognition and Hadoop to compile, interpret and build the classification database for organizations. We also bank on MongoDB, Django and Luigi to develop the architecture of the database and to develop and customize the user interface for our solutions. Why Outsource Automatic Document Classification and Indexing Software Development to getSmartcoders?